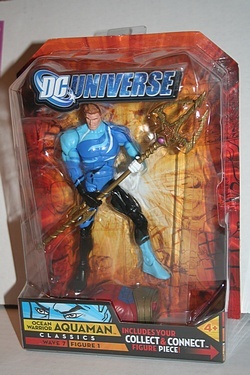 Since I managed to post a whole raft of DC Universe Classics figures the other day, let's keep the feature rolling with another entry from wave 7, Ocean Warrior Aquaman! First appearing in More Fun Comics in 1941 (war time! ), Prince Orin of Atlantis was raised in the ways of the surface world and renamed by adoptive parent, lighthouse keeper Arthur Curry. Click the image below for more images and details on everyone's favorite underwater monarch!